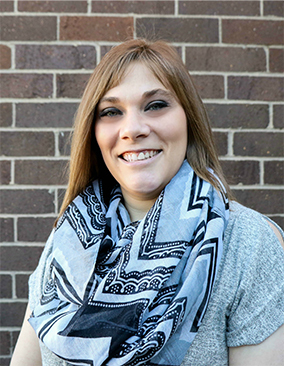 As ICF Program Director, Emily Britz started as a part time Direct Support Professional while going to school at Mankato State University, Mankato for Elementary Education. She had personal experiences of her own with individuals with disabilities, but never in a work environment. Once she started at the Harry Meyering, she felt that this was what she was supposed to be doing. After graduating, Emily wanted to go back to school to become a special education teacher, but she ventured on to other jobs, Human Service jobs, but never really felt the connection that she had while she was working at Harry Meyering. This connection has led her back to Harry Meyering on three different occasions and allowed her to continue to grow within the company. Emily’s inspiration comes from knowing that she has a family that depends on her to be a provider and a role model. When she is not busy running around with her five kiddos, she enjoys thrift store shopping, watching reality and drama shows on television and cleaning or organizing. She very much dislikes cotton balls – they make a funny sound. The thought, word and mere mention of these things makes her skin crawl.